Airborne carbon particles and dust are discolouring the Taj Mahal’s iconic marble dome and soaring minarets, giving the gleaming white landmark a brownish case, Indian and US researchers have found. “Our team was able to show that the pollutants discolouring the Taj Mahal are particulate matter: carbon from burning biomass and refuse, fossil fuels, and dust – possibly from agriculture and road traffic,” said Michael Bergin, a professor in the School of Earth and Atmospheric Sciences at the Georgia Institute of Technology. In addition to Georgia Tech, researchers from the Indian Institute of Technology at Kanpur (IIT-K), Archaeological Survey of India (ASI), and the University of Wisconsin collaborated on the project. Built in the 1600s by Mughal emperor Shah Jahan in memory of his wife, Mumtaz Mahal, the structure is a mausoleum that includes a massive marble dome 115 feet high and minarets that reach 130 feet. Attracting millions of visitors each year, the Taj Mahal became a UNESCO World Heritage Site in 1983. Beginning in the 1970s, observers noted a brownish cast to the white marble that makes up the structures. Routine cleaning, including the painstaking application and removal of a clay material, maintains the brightness of the marble. Air pollution had been suspected as the culprit responsible for the discolouration, but no systematic study had been done. 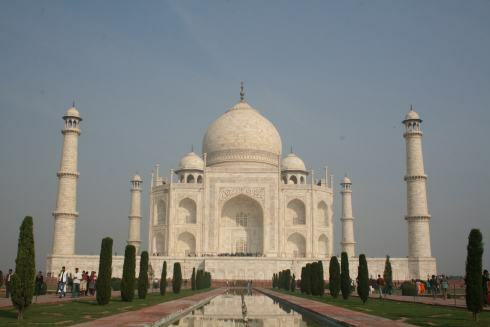 To find out what was causing the colour change, researchers used air sampling equipment to measure what was in the air in the Taj Mahal complex from November 2011 through June 2012. Filters from the air-sampling equipment were analysed for both fine particulate matter (smaller than 2.5 microns in diameter) and total suspended particulate matter. The researchers placed small samples of pristine marble onto the Taj Mahal at various locations near the main dome. After exposure to air pollutants over a two-month period, the samples were analysed using an electron microscope to measure the size and the number of particles deposited on their surfaces as well as their elemental signatures. This information allowed the researchers to determine the likely composition of the particles, Bergin said. They found particles of dust, brown organic carbon and black carbon in the filters and on the marble samples. The carbon particles come from a variety of sources, including fuel combustion, cooking and brick-making, trash and refuse burning, and vehicle exhaust. The dust may come from local agricultural activities and vehicular traffic – or from distant sources, researchers said. To check their analysis, the researchers refined a model for showing how the surface reflectance of the building’s marble should change with the application of brown and black carbon particles, along with dust. The predictions of the model matched what was being observed on the Taj Mahal.